At EVE Vegas, CCP Games announced that EVE: Valkyrie will launch on Steam for the HTC Vive this month. This will complete their full roll-out on the three major VR headsets, allowing cross-platform dogfighting. 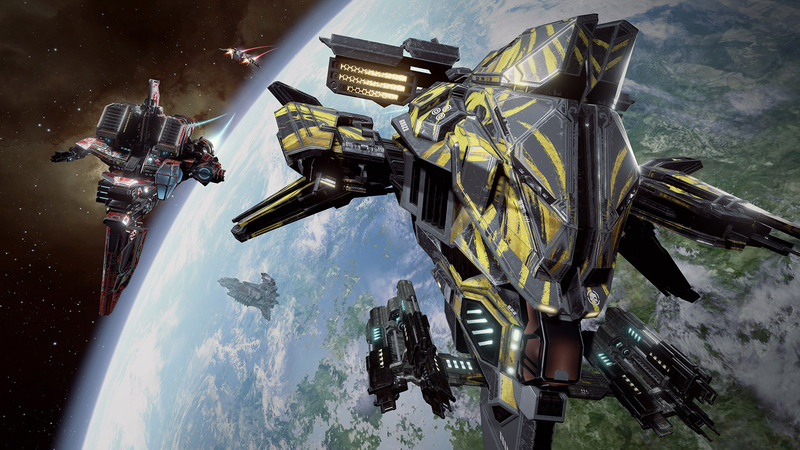 Initially bundled with the Oculus Rift on launch day, EVE: Valkyrie was one of the most compelling experiences available for early VR adopters. It was the ideal fit for the headset, as the Rift promoted seated VR, using the included Xbox One gamepad, which is exactly how Valkyrie is designed to be played. Based on the epic, persistent sci-fi universe that is Eve Online, Valkyrie takes a more accessible, arcade-action approach, using Eve’s lore and aesthetic to create a cockpit-based dogfighting space shooter. Fast-paced, first-person movement in VR can cause problems with user comfort, and being surrounded by a cockpit as a point of reference is a successful way of reducing the chances of nausea. 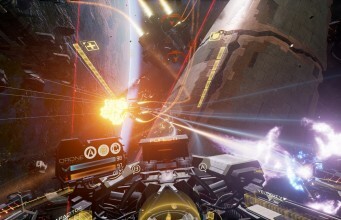 Simulating the sensation of sitting in a cockpit (while also being seated in reality) is the logical way of achieving comfortable freeform movement within a VR environment, and Valkyrie is one of the best titles to demonstrate this. CCP Games have quickly gained recognition for their expertise in VR and their AAA approach, having embraced and experimented with the medium for several years. The attention to detail and level of polish within Valkyrie is a match for the very best VR experiences, and it continues to be a stand-out title. The game also launched with PlayStation VR last month, achieving a successful transition to the console platform. The game is ideal for Sony’s device, as every PlayStation user has a gamepad, and the headset is even more focused on seated VR experiences than the Rift, due to its limited tracking volume. As a game that’s primarily focused on multiplayer gameplay, a healthy player population for Valkyrie is key. Cross platform play among the top three headsets is a major boon for the game and its players, as a larger population means the possibility of faster matchups and fairer ones too. While it has been possible to play the Rift version on Vive using the Revive hack, accessing an online game such as Valkyrie via Oculus Home (or indeed setting up an Oculus account just to buy Valkyrie) isn’t ideal, so Vive owners will be pleased to hear the wait is almost over for a native version to appear on Steam. While the game will remain optimised for gamepad, we’re interested to see whether CCP will enable any unique support for the Vive’s motion controllers. Exact date and timing of the launch is still TBD, but it won’t be long now until Vive owners can test their Valkyrie mettle against the likes of Rift and PSVR players. The post ‘EVE: Valkyrie’ Launches on Vive This Month, Joins Rift and PSVR Players appeared first on Road to VR.